Most of the time when working in web development there will be two types of operating systems. 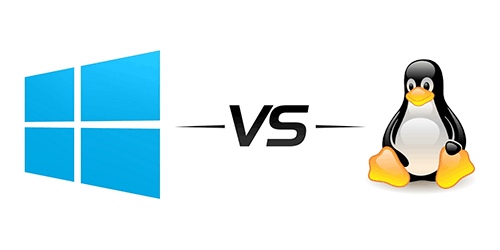 Linux Server vs Windows Server, which one is really the best server operating system? This could be a big decision depending on your business success. You might be wondering which one is better? As there isn't a clear-cut answer to this, we can take a look a the advantages and disadvantages to both of them. There are a few common features that you will find in both operating systems. First one is how to manage your website files. Linux and Windows both support FTP and SFTP. This is the ability to use File Transfer Protocol and connect to computers together. For server processing, you can easy use PHP, Perl, Python, Ruby. Database languages that can be used are MySQL and SQLite. Using Linux or Windows doesn't restrict any or the industry standard coding languages. Linux web hosting is probably the most used server operating system in the market. This is because of the cost. Linux is a free open-source operating system. This makes server software upgrades and management easy with no extra overhead. Web developers will set up a LAMP system environment. This gives them Linux, Apache, MySQL, and PHP software on their server. This is used because they all work seamlessly together. Using this type of environment is how most coders get started in web development. Some of the most used content management systems are developed this way. Applications like WordPress, Drupal and Joomla. There are some disadvantages by using a Linux server. The biggest one is server configuration. To make changes to a Linux server you will need to go "headless". This is where you log into the server using SSH and make changes via the command prompt. Most changes will be alternating text files and restarting services. Using a Windows server is going familiar to you. You will have a GUI interface that is similar to your home computer. If you have a project that requires to program in ASP.Net, you must use a Windows operating system. ASP.Net is a component similar to PHP that it is a server-side coding language. It can process and modify local server databases. Using a Windows server you can get more support for hardware and software. There are more options for email operations, antivirus, and backup applications. With these options, you can get more security protection from outside threats. Windows servers are just as reliable with downtime as Linux. Even if some type of mishap happens, Windows system restore and backup control, files can be easily restored. The biggest disadvantage to a Windows server is the cost. You will stronger hardware to run the operating system. Plus the cost of software and yearly upgrade management. As security is one of your biggest concerns when having a website. Even more, if you have an e-commerce store processing credit cards. The fact is when you have a server online, there is always the risk of attacks, malware, and viruses. Choosing either a Linux server or Windows doesn't change anything. They both have security problems. The best way to prevent attacks is to be aware. Be aware of what security updates are available and get them installed. Always keep your application up to date and run an antivirus. Having a good web hosting company can help ease these issues. Which Server Operating System is Better? It's hard to say which is the best server operating system. There are advantages and disadvantages to both of them. See what your website needs and then work from there. Linux servers are hard to configure but can be managed by a web hosting company. Come with no additional cost. Windows server will be easier to config and manage with a familiar interface. But will come with an increased cost. This argument will never go away. A big question is how best to support each solution. In today's world of virtualisation, it becomes tricky, as the number of good Linux server administrators becomes less. This in turn can become costly. Hmm! Linux Server is better for web hosting since it is free for MySQL and PHP. IT has this main advantage. It would decrease the hosting cost certainly and this is the major area of its winning. Security between Linux and windows is *NOT* equal, do your research, and update this article to make it more accurate. I never stated that they were equal. They both can have security issues if you are not aware of updates, firewalls, and other application vulnerabilities. Keeping on top of these things, you can run a secure server no matter which operating system you chose.